Felix Tshisekedi Is Sworn In As Congo's President Tshisekedi was declared the winner of last month's disputed election. Some groups allege that the opposition leader struck a deal with Congo's outgoing president. Felix Tshisekedi holds the constitution after being sworn in Thursday as president of the Democratic Republic of the Congo. The Democratic Republic of the Congo has sworn in Felix Tshisekedi as its first new president in 18 years, despite questions about the credibility of his election victory. 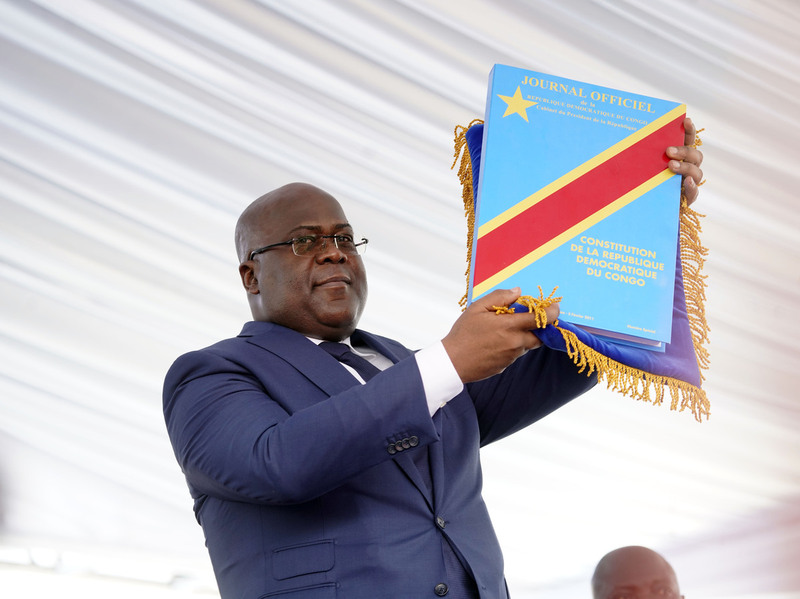 In his inaugural address Thursday, Tshisekedi called for a peaceful, reconciled Congo and vowed to release all political prisoners, in line with a December 2016 peace deal brokered by powerful Catholic bishops. His conciliatory appeal also included promises to tackle corruption in the mineral-rich, central African nation. The inauguration took place at the People's Palace in the capital, Kinshasa. At one point during his speech, Tshisekedi said he felt ill and national TV images briefly cut away from him, NPR's Ofeibea Quist-Arcton reports from Johannesburg. Witnesses say he sat down while assistants brought him water. Upon returning to the stage to continue his address, he told the crowd that he was exhausted after a prolonged electoral process. The U.S. State Department voiced its support for Tshisekedi's government on the eve of the inauguration, despite an earlier statement deploring a lack of transparency in the vote. "We encourage the government to include a broad representation of Congo's political stakeholders and to address reports of electoral irregularities," a spokesperson for the State Department wrote Wednesday. The electoral commission declared that Tshisekedi — an opposition leader and son of Congo's historic late opposition stalwart, Etienne Tshisekedi — defeated another opposition front-runner, Martin Fayulu, in the Dec. 30 election. But Fayulu contested the results, claiming the elections was rigged and that outgoing President Joseph Kabila had struck a backroom deal with Tshisekedi once it became clear that the governing coalition's candidate was unlikely to win. Last week, some African Union leaders and the head of the AU Commission demanded a suspension of the final results, citing "serious doubts" about their integrity and calling the situation a "post-electoral crisis." 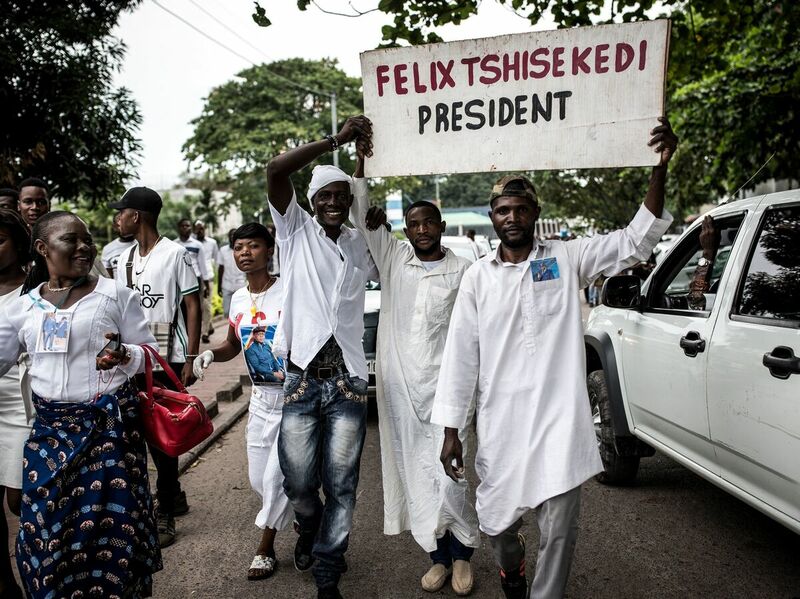 Supporters of the Democratic Republic of the Congo's new president celebrate ahead of Felix Tshisekedi's inauguration on Thursday. Congo's top court nonetheless confirmed Tshisekedi's victory on Sunday, saying he had defeated Fayulu 38 percent to 34 percent. Rejecting the Constitutional Court's decision, Fayulu declared himself the country's only legitimate president and urged nationwide protests. In the past several weeks, at least 12 people have died during clashes between security forces and supporters of Fayulu and those of Tshisekedi, The Wall Street Journal reports. Concerned that a protracted post-election dispute might further destabilize Congo, African nations and Western powers seem to have adopted a pragmatic approach in their acceptance of Tshisekedi's leadership, Quist-Arcton reports. Candidates criticized last month's election, which had been delayed since 2016, over the use of controversial new voting machines and the fact that the electoral commission decided to bar more than a million voters from participating over concerns about Ebola outbreak in the eastern part of the country. Congo's influential Catholic Church also rejected the victory, citing its own tally showing that Fayulu won a majority of the votes, Quist-Arcton reports. The church had deployed 40,000 observers for the December vote. Kabila had served as president of the vast African country since his father was assassinated in 2001. The term-limited president agreed to elections in 2016, but spent two years postponing the vote and ordered crackdowns following a series of protests. On Wednesday, Kabila said he had no regrets about relinquishing power to Tshisekedi.